Nicola D’Abate first appears in the Painesville, Ohio, area 1932. 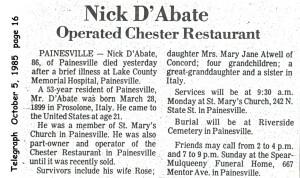 In America, Nicola D’Abate was known as Nick D’Abate. Nicola D’Abate, son of Giacomo D’Abate and Maria Felicia LaGamba, was born on March 28, 1899, at Frosolone, Italy. He married Rose Garzia, daughter of Angelo Garzia and Maria Teresa Zambino, about 1925. Nicola died on April 10, 1985, at Lake County Memorial Hospital, Painesville, Lake County, Ohio, at age 86. His body was interred at Riverside Cemetery at Painesville, Lake County, Ohio. Nicola D’Abate, age 21, immigrated to the United States on September 19, 1920, travelling to Morgantown, West Virginia. He was joining his uncle, Domenico D’Abate. Two of Nicola D’Abate’s siblings also lived in Painesville. His sister, Maria Cristina, migrated to Painesville in 1921; his brother, Felice, in 1927. Nick D’Abate was part owner and operator of Chester’s Restaurant in Painesville for many years. 1. Mary Jane D’Abate was born about 1935, at Ohio. She married Charles Atwell.